Note that there are spoilers ahead. If you haven’t seen Episode 7 from Season 6 of Game of Thrones, turn back! In last night’s “The Broken Man,” HBO once again took its foot off the gas in favor of a slower burn. Instead of gigantic reveals and shocking deaths, some big storylines are being set up for what will likely be an insane finale, which is just around the corner. 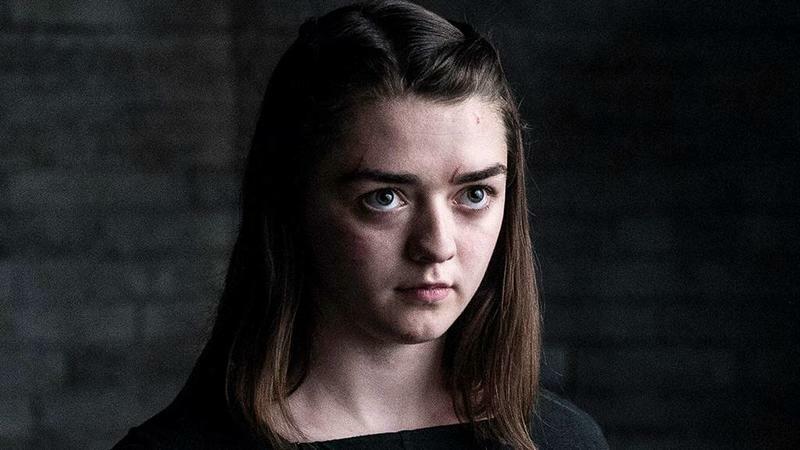 While the return of the Hound will no doubt have fans chomping at the bit, it was the Waif’s attack on Arya that has everyone talking. 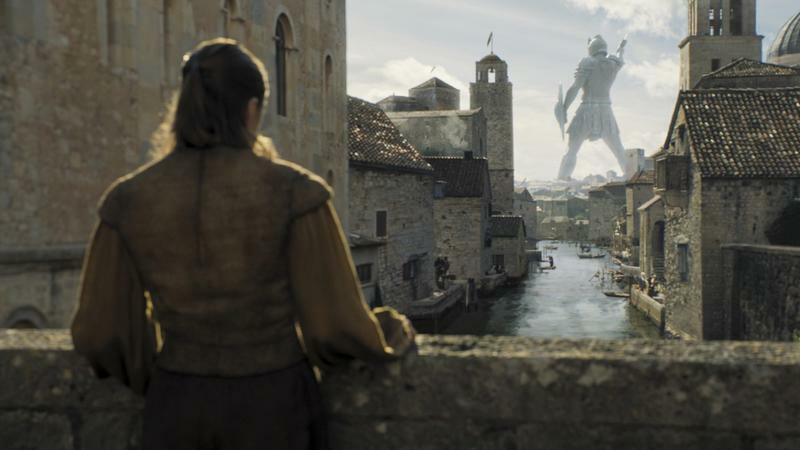 Last week, Arya went against the Faceless Man’s orders and intervened with her order to assassinate Lady Crane. It just so happened that the Waif was secretly supervising Arya at the time, who then reported the news back to Jaqen. Having seen Arya fail multiple times already, Jaqen reluctantly gives the Waif permission to kill Arya with the stipulation that the young Stark must not suffer. But, damn, it sure looked like the Waif, who has shown some pretty sadistic tendencies in earlier episodes, wanted Arya to suffer. After booking passage to Westeros, Arya contemplates her journey while admiring a sunset, which is when she’s approached by a kind old woman. 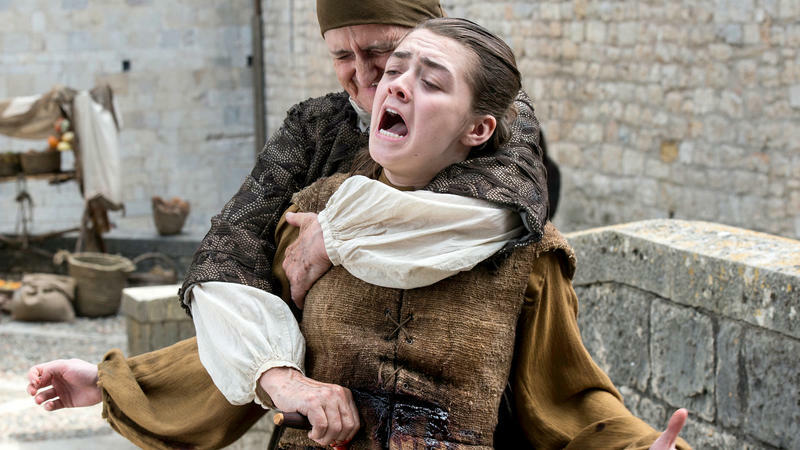 The old crone grabs on to Arya, unveils a knife, and stabs her repeatedly in the stomach, and even makes sure to twist the knife for maximum pain. 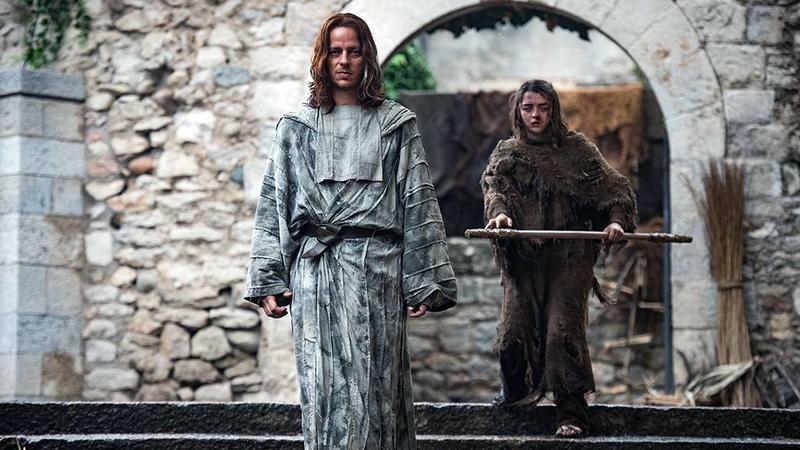 Arya manages to escape, but at the end of “The Broken Man,” she’s clearly in a heap of trouble with nowhere to turn, taking an eerie walk of atonement while everyone looks on. But I don’t buy it and there are a few possible scenarios where this might all be just one big trick. 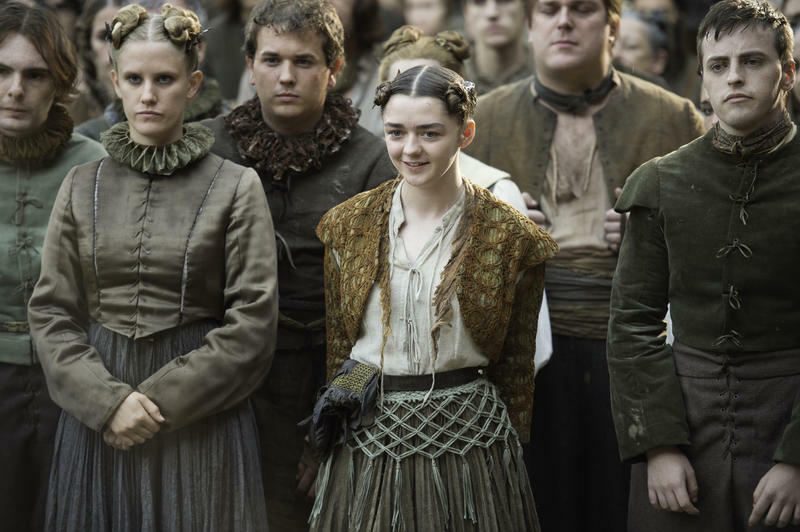 What we know is that Arya will show up in “No One,” the next episode of Game of Thrones set to air this coming Sunday. If you didn’t watch the preview for the upcoming episode (below), it’s clear the Waif is still on the hunt for the young girl, who doesn’t look any worse for the wear despite being stabbed in the stomach. Somehow, she appears healthy enough to perform parkour through the streets of Braavos, leading me to believe she might not be hurt at all. Either that or she literally has abs of steel. Never mind the fact that Jaqen owes Arya his life; the two formed a special bond before she made her way to Braavos, and he may be paying his final debt by helping Arya escape the Waif’s clutches. First of all, I’m not convinced Arya would traipse around Braavos when she knows the Waif might be looking for her. She knew what was at stake when she saved Lady Crane, and we already saw her take precautions by hiding out in a cave that night. So to see her so cavalier about the whole thing just isn’t very believable. Not only that, but she brazenly threw around pouches of money when trying to find passage back to Westeros. Clearly she wanted to draw attention; I don’t think the determined, whip-smart Arya we all know and love would so casually walk around when she’s the target of assassins. That’s why I think it might be Jaqen who has taken her place. We’ve already seen him wear Arya’s face, and he promised her three lives for the Red God after she saved his life. 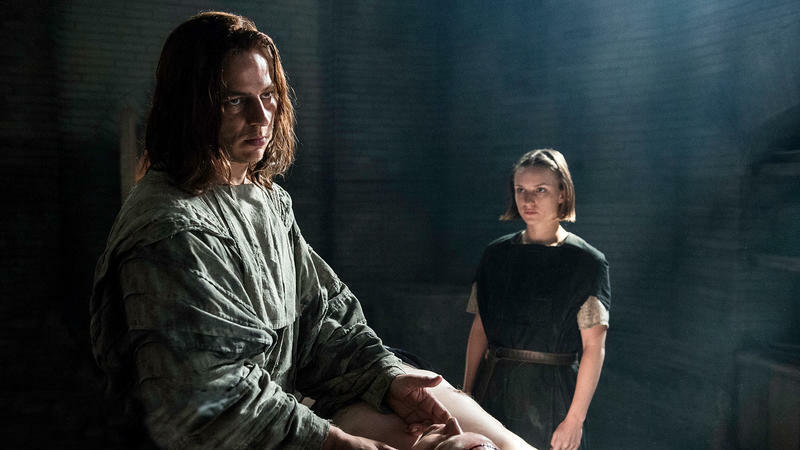 Jaqen has taken two lives for Arya already, and she named him as the third. The whole wrench in this theory is the fact that the Faceless Men wear the faces of the dead, so Jaqen couldn’t possibly be wearing Arya’s face. However, one only need to watch this to see that it can be done without the need of death. 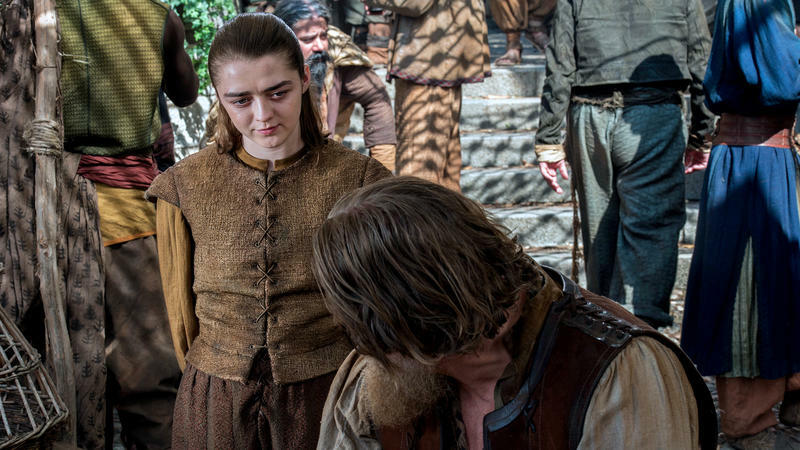 The second theory claims Arya used a pouch of pig’s blood over her stomach to fake her injuries. Apparently now that she’s found the Waif, Arya is luring the assassin using a trail of blood, where the two can then have a duel to the death. Again, based on the episode preview, we know the Waif is still after Arya, and although we saw her get stabbed, the young Stark certainly doesn’t look like she’s sustained any injuries. If she was stabbed, I’m not so sure—assuming that was Arya—how hurt she actually is. She didn’t look like she was in good shape after emerging from the water, and her walk of atonement looked absolutely brutal. However, that could have all been for show, a ruse to deceive the Faceless Men into thinking she’s on the verge of death. Another theory surmises Arya and the Waif are actually the same person. Yeah, mind blown. The theory goes that poor Arya has developed a bit of a personality disorder—one side is her lust for vengeance and the other is who Arya wants to become, a girl with no name and is loyal to the cause. There have been a few signs that the Waif doesn’t actually exist but all the evidence could just be confirmation bias. When Arya is blinded, the Waif proceeds to beat the crap out of her while people watch on. 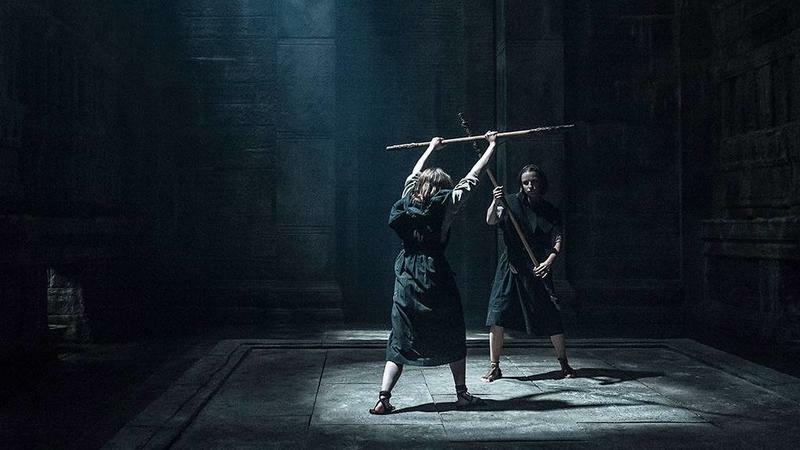 During the same fight, however, the Waif mysteriously disappears, leaving blind Arya to swing at shadows. The Waif’s attack in on Arya in “The Broken Man” could simply be the two sides clashing though neither has taken over completely. Of course, in the preview for Episode 8, we see Arya being chased by the Waif, so it doesn’t really look like this theory will hold up. Finally, could it be that Arya “hired” someone to take her place? This screenshot, via Reddit, could be evidence of that. If so, it means whoever she hired just went through an incredibly traumatic experience, getting stabbed and judged by the Braavos residents as she walked through that marketplace, leaving a trail of blood behind her. Based on the way “Arya” was able to escape the situation, it’s tough to say if that really was just a random person in an Arya face or if that really was her. There are so many dang possibilities that it’s tough to nail down just one. In any case, we’re going to get our answer this coming Sunday. Based on tricks we’ve seen pulled in past episodes of Game of Thrones, what we saw happen probably wasn’t what it seemed. Arya just wouldn’t be so cavalier about her life like that, would she?